And The Award For Most Corrupt Nation Goes To ... : Parallels Transparency International's annual index found that the economic crisis in Europe and turmoil in Arab Spring countries contributed to increased corruption. But when it came to naming the single most corrupt country, it was a three-way tie. 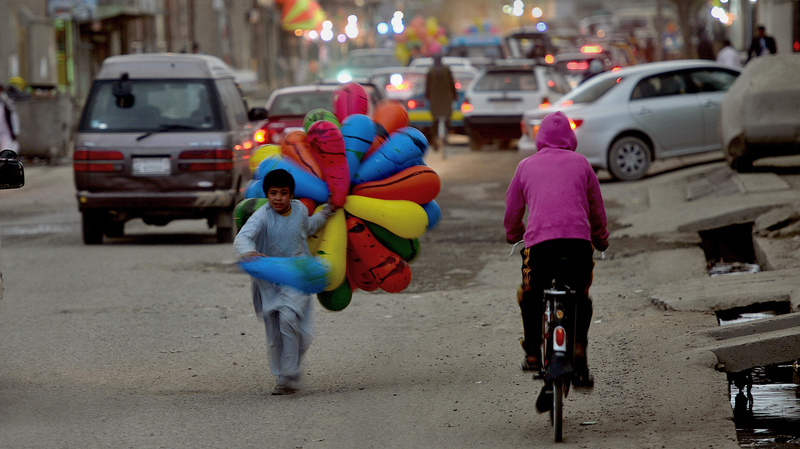 A young Afghan balloon seller runs toward a customer in Kabul on April 2. Afghanistan, North Korea and Somalia are the most-corrupt countries, according to the annual Corruption Perception Index released Tuesday. Each year, Transparency International releases its Corruption Perception Index, and this year, like most, the Scandinavian countries and New Zealand were at one end of the spectrum as the least-corrupt nations in the world. In the category of most-corrupt, there was a three-way tie: Afghanistan, North Korea and Somalia. The index by the watchdog group measures the perception of corruption in a country's public sector. It ranks nations on a scale from 0 (highly corrupt) to 100 (squeaky clean). Two-thirds of the 177 countries on the list scored below 50. The U.S. was among the least corrupt at No. 19 on the list, with a score of 73. "Spain's five-year economic slump, which has forced it to adopt tight austerity laws, exposed how cozy relations between politicians and construction magnates fed a disastrous housing bubble. The former treasurer of the governing People's Party (PP) told a judge that he had channeled cash donations from construction magnates into leaders' pockets, and he was found to have 48 million euros in Swiss bank accounts. The king's son-in-law, Inaki Urdangarin, was also charged this year with embezzling 6 million euros in public funds." "With the ouster of longtime Yemeni President Ali Abdullah Saleh last year, the lawlessness that followed led to an expansion of corruption in army, police and government agencies. "And in Syria with the ongoing civil war, smuggling, bribe paying and other issues have increased with the breakdown of state order." Corruption this year in Egypt was the same as last year, but the AP noted that the data for the country were collected before the coup that ousted President Mohammed Morsi in July. -- Myanmar showed the biggest improvement. The Southeast Asian country emerged from nearly five decades of military rule in 2011. It gained six points, climbing to 157th position. It was 172nd last year. Other big "improvers" were Brunei, Laos, Senegal, Nepal, Estonia, Greece, Lesotho and Latvia. -- The biggest "decliners" were: Syria, the Gambia, Guinea-Bissau, Libya, Mali, Spain, Eritrea, Mauritius, Yemen, Australia, Iceland, Slovenia, Guatemala, Madagascar and Congo Republic. You can click on the map below to see how countries fare in the rankings. But as the Guardian's Data Blog notes, Transparency's index has garnered its share of critics. One criticism is that the index conveys an "elite bias," but the organization points out that its index is "limited in scope, capturing perceptions of the extent of corruption in the public sector, from the perspective of businesspeople and country experts."